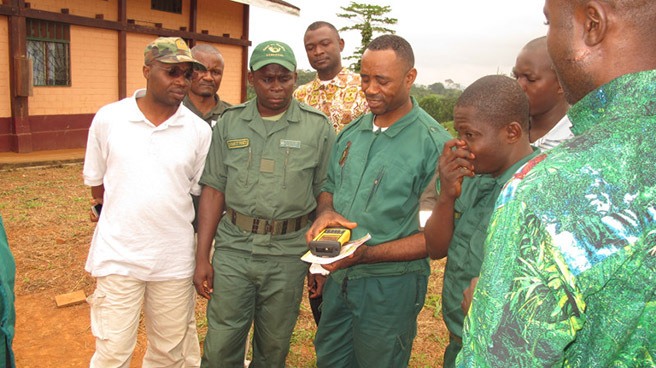 I’m just recently back in Lomie (on border of the Dja Faunal Reserve in Cameroon) from two days of practical training for rangers on the use of the CyberTracker/Trimble for ecological monitoring and anti-poaching. Instead of counting living monkeys, elephants, and great apes, we witnessed the arrest of about 15 poachers on more than five different occasions. We have been hiding and running, sleeping on the ground next to the fire with guards at both sides of our overnight spot— switching every two hours, assuring security. The Conservator, Achile Mengamenya, who was with us, has a good and dedicated team of park wardens (we were about 20). Nobody complains, while equipment is lacking, and everybody works hard. We were fed water and some rice and tomato sauce in the evening, and in the morning we have one or two beignets for each. The total amount of confiscated illegal wildlife, from the poachers, is surprising—sitatunga, forest duikers, living and dead pangolin, several species of monkey, freshly killed or smoked. No chimp, gorilla or elephant meat though…as these species are victim of a different type and more specialized category of hunters. We heard only one group of chimps was heard about 1 km from our campsite, so we can consider that this periphery of this Natural World Heritage site is probably almost hunted out. However, based on the interrogations of the arrested poachers, and witnesses of some park guards, it is clear that the Dja is still housing good numbers of all species, and remains attractive for a lot of people who prefer to put snares in the park instead of working on their fields in the village. With the Dja managers lacking any support for the last few years, and no control happening anymore, the Dja Biosphere is being hit very hard. And poachers are getting increasingly aggressive. Over the last few weeks, one guard got shot in his arm, another received a blow of a machete above his eye, and last night inhabitants of Lomie attacked the post of the Conservator and his team. Alain Lushimba (who is here with me, taking the lead in the training on cybertracker) and myself agree on the area’s high resemblance with the Lomako Yokokala Faunal Reserve. While being a beautiful forest with high potentials for biodiversity, the Dja is probably in the same conditions today as the Lomako forest was in 2004 when AWF started working in DRC. Support is needed. “Performance Based Management” and “Evidence-based Conservation” à la Lomako, and the lessons learned, will prove most helpful here. The park authorities and their team are extremely happy with the support we are giving. Today, we will adapt a work plan in order to respond, first of all, to the absolute priority to get those poachers out of the Reserve, restore law and order, and let the people know that the conservator and his team are operational again. All paths will be georeferenced, poaching camps destroyed, traces of gorillas, chimps, elephants, bongo and buffaloes recorded, and groups of monkeys—now all frightened—counted. Data will be shared with AWF headquarters the AWF-GIS (mapping) Centre. Evaluation on the ground is planned about 4 to 5months from now. Jef Dupain is AWF’s Director, African Apes Initiative. He holds degrees in biology and zoology from the University of Antwerp, has served as an associate professor for great ape conservation at Kyoto University, and has nearly 20 years of practical experience working on great ape conservation in and out of the field—he has an esteemed reputation as an authority on great ape conservation in Africa. This entry was posted in 2 CyberTracker Software, 4 The Art of Tracking, 6 Conservation and tagged anti-poaching, Cameroon, chimpanzee, CyberTracker, Dja, elephants, gorilla, poachers on 2014/02/12 by Louis Liebenberg.